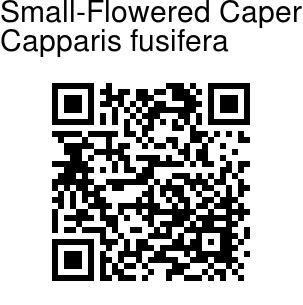 Small-Flowered Caper is an erect much branched shrub, slightly hairy. Flowers are borne singly or 2-3 together. Petals are white, 1.5 cm long, obovate, blunt. Numerous white stamens protrude out of the flower, longer than the petals. Spines are very small on either sides of the leaf-stalk. Leaves are up to 18 x 7 cm, elliptic, pointed at either ends, leathery, hairless, lateral nerves 8-10 pairs; leaf-stalk 0.5 cm, stout. Berry is 4 x 2 cm, ellipsoid, rind hard; flower-stalk 7 mm in fruit. 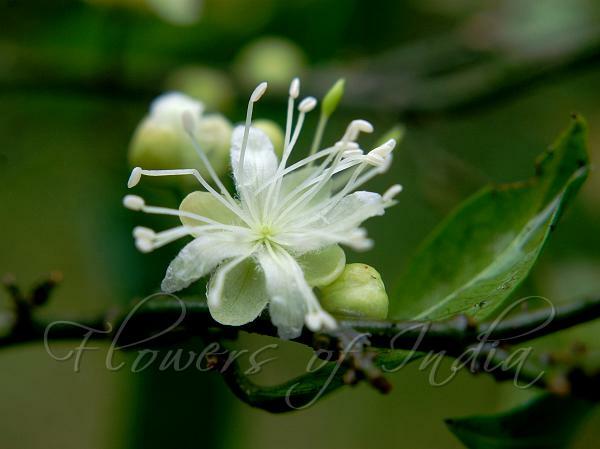 Small-Flowered Caper is endemic to Southern Western Ghats. Flowering: October-January.